Apple shares are currently trading for around $143 after Monday's opening bell, around 3.5 percent lower than Friday's closing price of $148.98. Apple's stock has dropped around 8 percent since reaching an all-time high of $156.10 on May 12, amid a wider downturn in the stock market. Technology stocks have been hit particularly hard, as some investment firms fear that stocks like Facebook, Amazon, Netflix, and Alphabet in particular rose too quickly. Japanese bank Mizuho downgraded Apple to a "hold" rating today, as analyst Abhey Lamba believes enthusiasm around the company's upcoming product cycle is "fully captured" at current levels, with limited upside to estimates from here on out. The bank lowered its AAPL price target to $150, down from $160. Andy Hargreaves, equity research analyst at Pacific Crest Securities, also downgraded Apple's stock last week. In a research note distributed to clients, he said excitement surrounding the so-called "iPhone 8" appeared to be "priced in," compounded by risks such as the potential for gross margin pressure. Wall Street analyst Brian White of Drexel Hamilton believes otherwise, calling the recent dip in Apple's stock price another buying opportunity. "In our view, Friday's sell-off in Apple represents yet another buying opportunity as investors turn their focus to the iPhone 8 this fall, along with the company's raised capital distribution initiative, depressed valuation, and new innovations," said White, in a research note distributed to clients on Monday. "We continue to believe Apple remains among the most underappreciated stocks in the world," he added. 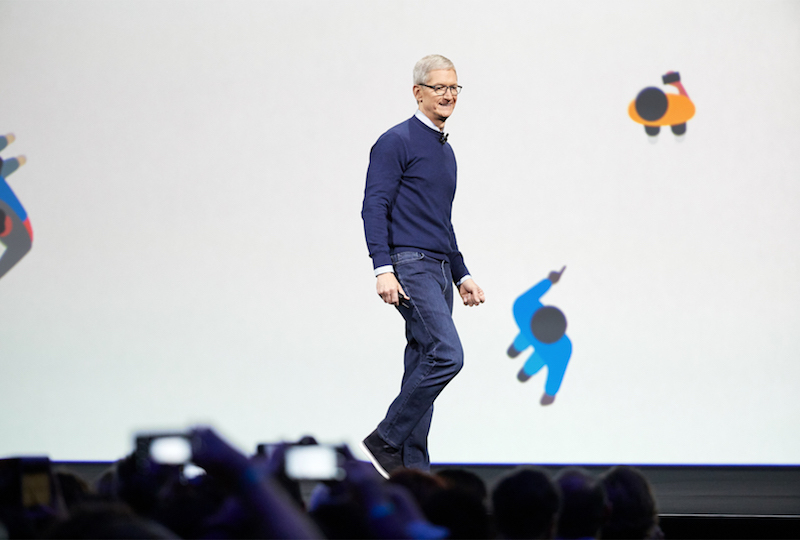 White said Apple shouldn't be compared to the likes of Facebook, Amazon, Netflix, and Google, jointly called FANG, as the iPhone maker's stock has significantly underperformed against its rivals over the past five years. "For example, the average 'FANG' stock is up 674 percent over the past five years compared to a 100 percent increase for Apple and a 84 percent rise for the S&P 500 Index," said White, in a note obtained by MacRumors. "Even Microsoft has outperformed Apple with a 175 percent increase during this time." White said Apple has "demonstrated resilience" through its "unique ability" to develop hardware, software, and services that work seamlessly together, despite seemingly never-ending concerns that the iPhone maker will fall victim to the missteps of consumer electronic companies of the past. And it'll rocket to new heights with this Fall's iPhone 8 release. Place your bets now. A stock broker once told me the stock market is controlled by top 100 people. The rest of us are just sheep trying to make a couple bucks. As someone who bought in when it was $91 I'm just fine with a little back and forth at this point. Some analysts have the target as low as 120, and others as high as 202. The moral of the story is: the fundamentals are strong, the P/E is in a good place, and the company is solvent. it's amazing/scary how an APPL downgrade can move the whole tech sector. No, it was Goldman Sachs saying FAAMG is overvalued, not Apple pulling everything down. Just Goldman trying to manipulate stock prices. Pisses me off as an AMZN shareholder. Well this definitely calls for traditional comments we have 'APPLE IS DOOMED". But seriously how short sighted is this article !! A stich in time saves nine. Whole Nasdaq is down from profit taking since Friday afternoon. Stock market is not for weak hands. Doing your homework and buying only when the sheep selloff is key. A 8% drop is not enough to buy big, but if you lost the recent rally it's a nice entry point for an increase in position. Time to slash! the Prices of new iPad Pro. it's ridiculously Priced!